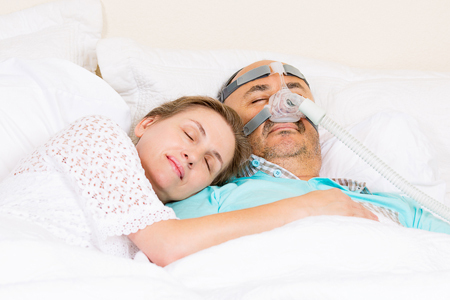 You’ve been diagnosed with Sleep Apnea – now what? We understand that you will have mixed feelings about your diagnosis so we are here to support you! We partner with you and your physician to help facilitate a smooth transition to treatment and ongoing management. We are committed to offering you the support you need to management your sleep health and improve your quality of life. Insurance Guidelines require that we obtain a copy of your diagnostic sleep study, prescription and your doctor’s consultation notes explaining the need for the sleep study. We start the process immediately to shorten the time from diagnosis to initiation of treatment. Within one to two business days of receiving the documents, we contact patients to schedule an appointment and discuss if any further documents or authorizations are required. We review insurance coverage, provide an estimate of their out of pocket expense and explain what the respiratory therapist will do at the time of the first appointment. Patients have the opportunity to ask any questions they may still have about their treatment and ongoing disease management. We suggest you plan approximately one hour for this appointment. Our certified respiratory therapist will do a mask fitting, demonstrate how to use and clean the equipment and discuss how often to replace supplies. What if I have issues with the pressure settings? If you have issues with pressure settings on the unit you need to contact your doctor right away, we are unable to change pressure settings without a prescription from your doctor. If I do not like the mask I was given at the time of the setup do I have to pay for a different one? At the initial appointment, patients are fitted for either a nasal mask or full face mask. If a patient is unable to tolerate the mask, we offer a free exchange within 30 days for a same category mask (e.g. a nasal mask can be exchanged for another nasal mask and a full face mask can be exchange for another full face mask). However, if the patient wants to switch to a different type of mask such as a nasal instead of a full face mask, the insurance would be billed for the new mask. What if I do not like the PAP therapy? We urge patients to dicuss concerns with their referring physician to determine if there are viable alternatives based on the patient’s diagnosis. How long does it take to be scheduled? Depending on the individual insurance company authorizations which could be 7-10 business days, sometimes even up to 15 business days. We keep the patient informed along the way and make every effort to expedite the process. We are committed to securing the documentation as quickly as possible and will schedule patients within 1-2 business days upon receipt of the necessary documentation. What is the impact on my insurance if I return my equipment? If your insurance is still renting the unit up to the purchase price we will stop billing insurance, but the patient will be responsible for any out of pocket costs for a deductible or co-pay. Who will train me on the use of my new CPAP? At your first appointment, our certified respitory therapists will train you and answer any questions you may have about using your new CPAP. How often should I replace my CPAP supplies? At your first appointment, our certified respitory therapist will review recommended replacement schedules for each of the supplies required for your equipment. CPAPs and Humidifiers are considered to have a Reasonable Useful Lifetime of Five Years. However, if your device is over five years old, that does not mean that you can automatically get new equipment. You will need a new prescription from your doctor as well as the doctor’s explanation as to why the equipment must be replaced. It is insufficient to simply say that the device needs to be replaced because it is over five years old. Masks can be replaced as often as once every three months. Ironically, the headgear (the straps that hold the mask on your face) is only covered once every six months. At Grove Medical, we recognize that when you are ready for a new mask, you’ll need new headgear as well, so if you order a new mask, we’ll make sure it comes with new headgear, even if we give it to you for free. The cushions (or nasal pillows) on the mask can be replaced as frequently as twice per month. Since Grove Medical offers you opportunities to order supplies once every three months, you can get as many as six replacement cushions or pillows. If you use a Full Face Mask, the guidelines are different and your can only receive one replacement cushion per month (Three every three months). The six foot tube between your mask and the device can be replaced as often as once every three months. If your device also has a gray foam (non-disposable) filter, it can be replaced as often as once every six months. Can I Use my CPAP on an airplane? If you’re going to travelling by air for a long flight, you may have wondered if it is possible to use your CPAP device on the airplane. After all, sleep apnea can occur any time we sleep (including naps) and not just when we are in the comfort of our bed at home. While the thought of wearing your CPAP mask in public while sitting next to strangers might sound awful, chances are that they would actually prefer it compared to sitting near someone who is snoring, gasping and choking for an hour or more. Can you use a CPAP on an airplane? Theoretically, the answer is yes, but practically speaking, the answer is, “it depends.” In order to use a CPAP during a flight, you must obtain permission to do so in advance. Appealing to a flight attendant while the plane is in the air is not advisable. CPAP use is dependent on each airline’s individual policy. I advise strongly recommend calling the airline at least a week in advance of the flight. You will need to get in touch with the medical director of the airline (yes, every airline has a medical director) and explain that you will be on flight XYZ123 on a certain date, the flight is X hours long, you have sleep apnea, and that it would be of benefit to your fellow passengers if you were allowed to use your CPAP during the flight. Some airlines have well-defined policies. The flight time may have to exceed a certain duration, and you may even have to use a specific brand and model CPAP device that has been pre-approved by the airline. I advise patients to stress the benefit to your fellow passengers, rather than your own medical need. The last thing you want is to get into an argument with the medical director about your condition. While I’ve never heard of anyone requiring a doctor’s note, it’s not inconceivable. Once you have permission, the world opens up for you. Some patients have told me that they were able to get early boarding due to a “medical condition.” When you’ve got the medical director’s blessing, they will make sure you are placed in a seat that has access to AC power so that you can simply plug in your CPAP as you do at home. Sometimes, that can mean a free upgrade to business class or higher, where AC outlets are more the norm. I once had a patient who got a free upgrade from economy to first class for a trip from San Francisco to Scotland, not only for himself, but for his entire family of four! A word of caution, though, about humidification. As tempting as it may be to use your humidifier with the dry, recycled air inside a plane, the possibility of turbulence and water splashing into your CPAP means that use of your humidifier is a bad idea. What could be worse than arriving at your destination to find that your CPAP is broken due to water damage? In sum, using your CPAP on an airplane is possible, but plan ahead. Contact the medical director of the airline and do not use your humidifier. What happens if I lose my insurance coverage while my machine is still under rental? Patients can opt to either return the unit and pay for any balance before they lost their insurance, or if they like to retain it and can pay for the remaining months of rental. We offer patients the price of the contracted allowed amount of their insurance. Yes, we accept Medicare and most insurance plans. Please see the full list of covered insurance plans below. Please call us to verify coverage. Details of coverage vary with the particular type of policy you have. *Note: Ability to service out-of-network patients depends on the patient’s specific plan and out-of-network benefits. ** Note: We have numerous other insurance contracts and plans that we accept.